Pinch pleat drapes are a classic window treatment. This drapery style is highly versatile and can just as easily be used in an elegant formal room design or a casual one. The draperies are created by a series of pleats that are gathered in groups of three or more pleats along the top of the drapery fabric. The spacing between each group of pleats is typically two to three inches apart. The header above the pleats is also usually two to three inches, depending on the style of pleating. The appeal of this style of drapery construction is that the fabric falls to the floor with neat rounded folds that have a permanent look. Whether or not your draperies are closed or open, the fabric holds these pleated shapes. Triple pinch pleat: Three pleats typically have a three inch header and are created by having three pleats per width. You can also find a four-fold pinch pleat that is created the same way as the triple. 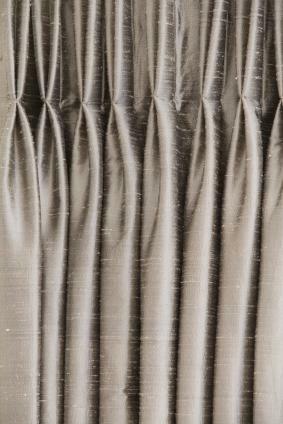 Butterfly pinch pleats: Comprised of a minimum of five pinch pleats per width, the butterfly pinch pleat is stitched two inches from the top of the drapery material. This stitching causes the top two inches of the pleat to fan out in a butterfly effect. Double pinch pleats: Created the same way that the triple pinch pleat is made, the double pinch is just that, two pleats sewn together. Fan pinch pleats (also known as the French pleat): This is a different looking pleat that is usually comprised of three pleats but unlike the other pinch pleats, this one has no header and the pleats are sewn together at the very top of the drapery material. Goblet pinch pleats: This style lives up to its name and resembles cylindrical goblets. The pleats are stuffed so the base opens up and bowls out. Inverted pinch pleat: Pinch pleats are sewn on the front of the drapery fabric, but with inverted pinch pleats, these are sewn on the back of the fabric. The pleats are then pressed flat and the space between these pleats, known as the ditch, are sewn from the front of the drapery fabric along the seam lines. This type of pleat is hidden but gives the same type of effect. Pencil pinch pleats: The most popular style of pinch pleats are pencil pleats. These are created to be deep pleats that are drawn tightly together to form highly crisp-looking pleats and are slender like a pencil. Rollback pinch pleats: This turn-back pleated style creates a deeper and wider column that carries the pleated fabric form to the floor. There are many online drapery shops where you can purchase either ready-made or custom-made draperies, especially pinch pleat styles. You may buy ready-made pinch pleated draperies, have them custom-made or perhaps you're an accomplished seamstress and may decide to make your own draperies. Once you have your draperies and are ready to hang them, it doesn't matter if you spent a lot of money or worked within a budget; if you don't hang them correctly, they'll look cheap. Measuring for your drapes: You want to make sure you allow for the amount of space pinch pleated draperies take up when open. The pleats create more bulk than panel draperies, so you want to be sure you allow for this fabric in what's known as stack back. This term refers to the open position when the draperies are pulled back on either side. By the same token, you want enough drapery fabric that's wide enough to cover the width of your window, the rod return as well as the desirable overlap effect when the draperies are closed. A good rule of thumb is to allow two to three times fabric width as the actual width of your window. For example, if your window measurement is 60 inches, then you want the actual draperies to be 120 to 180 inches wide. Drapery pins: To get the professional look of even-hanging draperies, you must first get all of the drapery pins inserted into the pleats at the same distance from the top (header) of the draperies. It's crucial that the pin placement is even. Use a measuring tape to ensure that all of the pins are lined up. Train drapery pleats: Sometimes even after steaming and correctly hanging draperies, the pleats don't cooperate and hang as they should. You can correct this common problem by training the pleats with control clips that you clip onto pleats, typically clipping them onto the back of your fabric so as not to show. Double traverse drapery rod: Many people prefer some form of privacy barrier, yet need to open the draperies during the daytime. Some opt for mini-blinds or shades while others prefer to hang a sheer curtain directly behind the pleated drapery. You can accommodate the latter effect with a double traverse drapery rod. Keep all of these tips in mind when making your final decision and ordering. Take into consideration how much light comes into the room. Do you need to screen harsh Western sunlight in the summer months? Perhaps the windows in your room face North with very little light entering yet the room is very cold in the winter. You may prefer to purchase two sets of draperies, a lightweight fabric and a thermal backed draperies. You have a wide selection of choices when it comes to these fabrics and more in a pinch pleat design.